Order The Andersen Accounts: The Price of a Life online to unlock all its features and be able to play it beyond the 1 hour trial period. The ordering process is easy and safe. 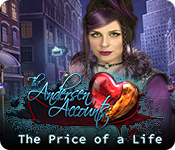 After the procedure is completed you will get instant access to the full version of The Andersen Accounts: The Price of a Life.